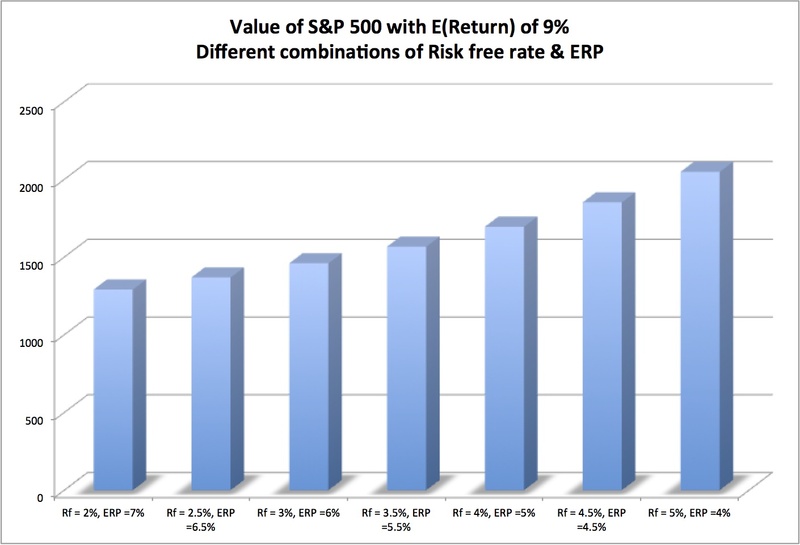 If you have been following my blog postings, you are probably aware that I have an obsession with equity risk premiums (ERP), and have done an annual survey paper on the topic every year since 2008 (with the 2013 update here). I also post a monthly update for the ERP for the S&P 500 at the start of the month on my website. As a consequence, my attention was drawn to a post by Fernando Duarte and Carlo Rosa, economists at the Fed in New York, on the topic. They argue that equity risk premiums are at historic highs, primarily because the US treasury rates are low, and note that these high equity risk premiums are a precursor to good stock returns in the future. 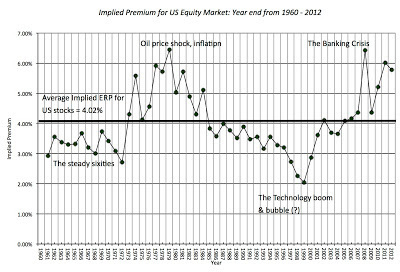 I don’t disagree with their authors that equity risk premiums are high, relative to history and that the low risk free rate is in large part responsible these large premiums, but I am less sanguine about using the ERP as a market timing device, especially at this time in history. There are three ways of estimating an equity risk premium. One is to look at the difference between the average historical return you would have earned investing in stocks and the return on a risk free investment. 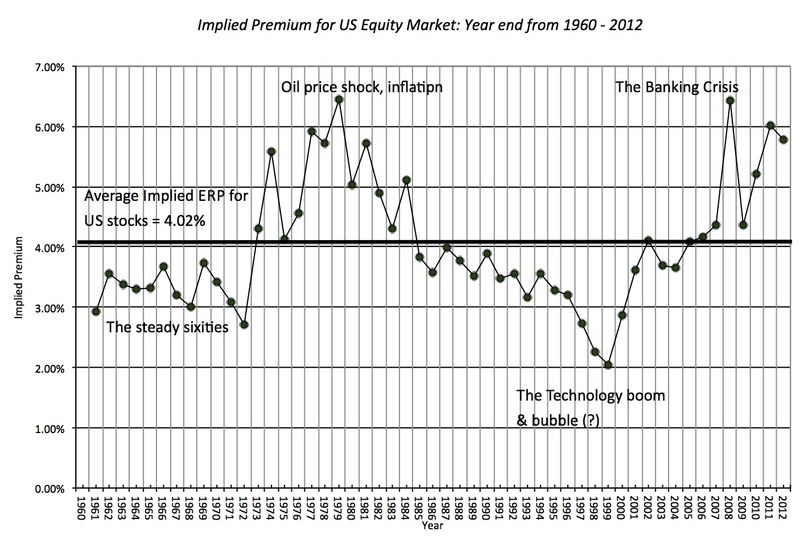 This historical premium for the 1928-2013 time period would have stood at about 4.20%, if computed as the difference in compounded returns on US stocks and on the 10-year US treasury bond. (I know. I know. We can have a debate about whether the US treasury is truly risk free, but that is a discussion for a different forum.) The second is to survey portfolio managers, CFOs or investors about what they think stocks will generate as returns in future periods and back out the equity risk premium from these survey numbers. In early 2013, that survey premium would have yielded between 3.8% (from the CFO survey) to 4.8% (portfolio managers) to 5% (analysts). Finally, you can back out a forward looking premium, based upon current stock prices and expected cash flows, akin to estimating the yield to maturity on a bond. That is the process that I use at the start of every month to compute the ERP for US stocks, and that number stood at 5.45% On May 18, 2013. The equity risk premium is the extra return that investors demand over and above a risk free rate to invest in equities as a class. Thus, it is a receptacle for investor hopes and fears, with the number rising when the fear quotient dominates the hope quotient. In buoyant times, when investors are not fazed by risk and hope is the dominant force, equity risk premiums can fall. In the graph below, you can see my estimates of the implied equity risk premium for US stocks from 1961 to 2012 (year ends) with annotations providing my rationale for the shifts over time periods. The average implied equity risk premium over the entire period is 4.02% and that number is the basis for the bullishness that some investors/analysts bring to the market. If the equity risk premium, currently at 5.45%, does drop to 4.02% , the S&P 500 would trade at 2270, an increase of 26.5% on current levels. And history, as Duarte and Rosa note, is on your side, albeit with significant noise, in making this assumption that equity risk premiums revert back to norms over time. As I will argue in the next section, the high ERP in 2013 is very different from high ERPs in previous time periods and extrapolating from past history can be dangerous. This equity risk premium, though, is over and above the risk free rate. To provide a sense of the interplay between the risk free rate and the equity risk premium, I plot the expected return on stocks (based upon future cash flows and current stock prices), decomposed into the equity risk premium and the and the risk free rate each year from 1962 to 2012. 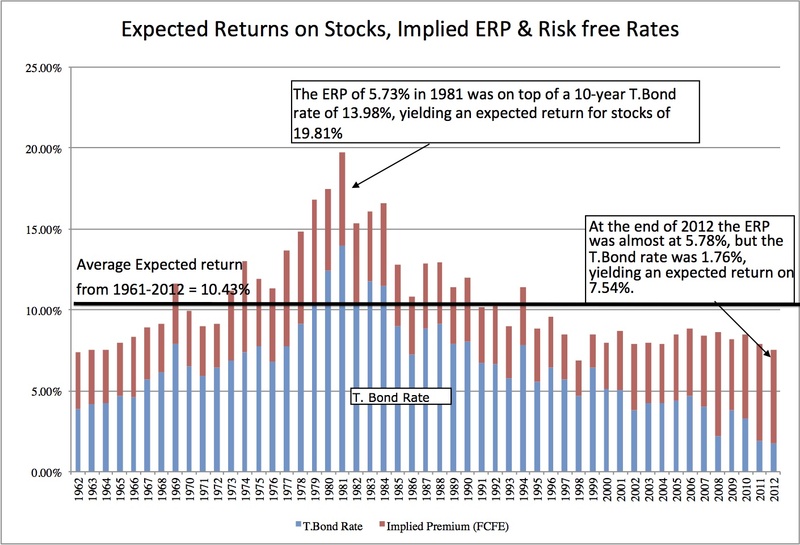 Over the last decade, the expected return on stocks has stayed surprisingly stable at between 8-9% and almost all of the variation in the ERP over the decade has come from the risk free rate. In particular, the higher ERP over the last five years can be entirely attributed to the risk free rates dropping to historic lows. In fact, the expected return on stocks on May 18, 2013 of 7.40% is close to the historic low for this number of 6.91% at the end of 1998. During this period, a 1% increase in interest rates would have led to an increase of 0.26% in the ERP. The last decade has weakened the relationship between the ERP and the T.Bond rate dramatically. In light of this evidence, consider again two periods with high ERPs. In 1981, the ERP was 5.73%, but it was on top of a ten-year US treasury bond rate of 13.98%, yielding an expected return for stocks of 19.71%. On May 1, 2013, the ERP is at 5.70% but it rests on a US treasury bond rate of 1.65%, resulting in an expected return on 7.35%. 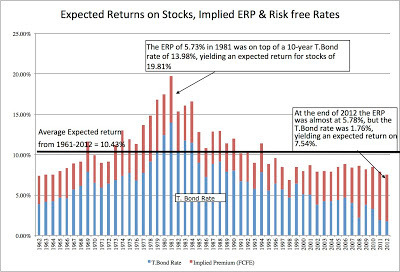 An investor betting on ERP declining in 1979 had two forces working in his favor: that the ERP would revert back to historic averages and that the US treasury bond rate would also decline towards past norms An investor in 2013 is faced with the reality that the US treasury bond rate does not have much room to get lower and, if mean reversion holds, has plenty of room to move up, and if history holds, it will take the ERP up with it. Thus, the same mean reversion that market bulls point to with the ERP can be used to make a bearish case for stocks. The historical average expected return for stocks between 1960 and 2012 of 10.43%, this would translate into the S&P 500 being over valued between 12-40%, depending upon the composition of the expected return. In fact, that is the reason that you have the large divergence in the market between those who use normalized PE ratios and argue that stocks are massively overpriced and those who use the equity risk premium or the Fed model today to make the opposite case. I am sure that you have your own views on both where the risk free rate and the equity risk premium are headed. If you want to explore the effect on stock prices of changing the variables, please use the linked spreadsheet. In a previous post, I noted that stocks do not look over priced. While you may feel that this post is in direct contradiction, let me hasten to provide the bridge between the two. In the prior post, I noted that stock prices are being sustained by four legs: (1) robust cash flows, taking the form of dividends and buybacks at historic highs for US companies, (2) a recovering economy (and earnings growth that comes with it), (3) ERP at above-normal levels and (4) low risk free rates. Thus, my argument is a relative one: given how other financial assets are being priced and the level of interest rates right now, stocks look reasonably priced. The danger, though, is that the US T.Bond rate is not only at a historic low but that it may be too low, relative to its intrinsic level, based upon expected inflation and expected real growth (a topic for another blog post coming soon). If you believe that the T.Bond rate is too low, then you have the possibility that you are in the midst of a Fed-induced market bubble(s) and that script never has a good ending. The scary part is that there are no obvious safe havens: gold and silver have had a good run but don’t seem like a bargain and central banks around the world seem to be following the Fed’s script of low interest rates. You could use derivatives to buy short term insurance against a market collapse but, given that you are not alone in your fears about the market, you will pay a hefty price. There is a middle ground. In my last ERP update, I argued that stock market investors were dancing to the Fed’s tune and wondering whether the music would stop. Let me rephrase that. If the market is dancing to the Fed’s tune, it is not a question of whether the music will stop, but when. When long term interest rates move back up, as they inevitably will, the question of how much the equity markets will be affected will depend in large part on whether the ERP declines enough to offset the interest rate effect. Thus, while I would not be arguing that stocks are cheap, simply because the ERP today is higher than historic norms, I am not ready to scale down the equity portion of my portfolio (especially since I have no place to put that money). 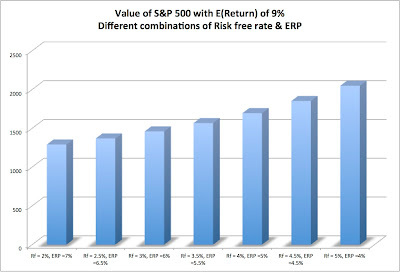 Looking at the table of market sensitivity to risk free rate/ERP combinations, there are enough soft landing scenarios for the market that I will continue to buy individual stocks, while keeping an eye on the ERP & T.Bond rate.